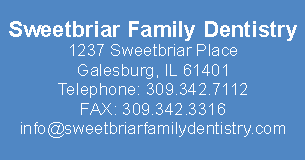 Thank you for choosing Sweetbriar Family Dentistry as your dental provider. We understand your time is a precious commodity. To save you time on your appointment day, please download, complete and print the Patient Registration and Medical History forms provided below. These forms are fillable within Adobe Acrobat Reader. Once downloaded and completed, the forms may be emailed to the office, printed and faxed, or simply brought with you on the day of your appointment. If you prefer to fax the forms, you may fax them to us at 309.342-3316. NOTE: You must first download the form to your computer before emailing the form to us. We want to make sure you get the best value for your dental care. This is why our pricing is competitive and fair. We present dental plans in smart phases that make it possible for you to afford the care you need. This Written Financial Policy is contained within the Patient Registration Form mentioned above. We accept cash, check, Visa, MasterCard, American Express and Discover Card. For patients with dental insurance, we will gladly file dental claims with your carrier but we ask for your estimated portion on the date of service. We also offer financing through Care Credit, a healthcare credit card that offers convenient monthly payment options. Click here to learn more about Care Credit and to complete an application. We would greatly appreciate a 48 hour notice from any patient (or patient representative) should they need to reschedule or cancel an appointment. We reserve the right to apply a cancellation fee if this policy is not respected. Academy of General Dentistry The Academy of General Dentistry is an organization of general dentists dedicated to continuing education and reliable consumer information. American Dental Association The ADA has grown to become the leading source of oral health related information for dentists and their patients. INVISALIGN Invisible braces align and straighten teeth invisibly, without metal braces. Care Credit Always there when you need it. Use the CareCredit healthcare credit card for your life needs - even for your pets. Apply Now! Colgate Trusted resource for dental health information and oral care products. Oral-B Oral-B developed this learning center for dental health education to promote oral care habits that are essential to the lifelong health of teeth and gums. The site offers information and advice for children, adults, and dental health teachers. Sonicare Learn how the Sonicare toothbrush creates an indescribable clean feeling, the benefits you can expect, and even take a factory tour. Crest Keep your smile healthy and beautiful. Entrust your smile to Crest. Learn more about Crest's full line of dental hygiene products including toothpaste, toothbrushes, mouthwash, and teeth whitening.